Digital marketing has been super important to us here at BELLA+CANVAS for some time now. We obviously love video, but our Instagram account is also a big priority. We’re always looking for new ways to connect with our customers, grow our followers and organically tell our story. While we’re pretty proud of what we’ve accomplished so far, we love getting Instagram tips from those who have been more successful. That’s why we teamed up with Casey, our friend and co-owner of the clothing brand and popular Instagram account, Coffee in the Shower. Casey and his awesome wife were able to organically grow their account to over 130-thousand followers in just two years by following a few simple guidelines. Keep reading to learn five Instagram tips that will help your brand grow drastically on social media. Make sure that both your image and your caption are in the same “language” that your customers speak. This means you have to first understand who your audience is and what they look. Look at the analytics of your previous posts as well as your competitors’. See who your audience is, how old they are, what they like, when they like it, etc. All this analysis then can be incorporated into your posts. This is the next step after making sure you speak your customers’ language. Once you understand their language and habits, make sure your content is worthy enough for them to share. Casey’s tip is to not just post a photo of your product, but instead, try to turn your product into a meme, which followers are more likely to share. Your page is great, but if you have other people out there also sharing your content, you are more likely to not only increase your followers but increase your sales. Find brand advocates to speak highly of your brand and your products. Also, find influencers, or any like-minded account with a larger following than you, and establish a relationship. Incentivize them to share your content or create a mutual deal where you share each other’s content. These allies will be a huge for all growth. This is a really important tip! It’s great if you have a loyal fan base, but that will only go so far in terms of growing your brand if they aren’t buying your products. You should link your Instagram to an easy-to-checkout website. Casey prefers to use Shopify, because the templates for creating the site are super simple for the brand, and it’s also an easy and seamless experience for a customer on the other side. If you’re able to get the Instagram follower over to your website, you want them to be able to land right on the product they were interested in, make it easy to check, pay and get on their way. Learn more and see examples for each tip in our video with Casey below. You can also check out @coffeeintheshower to see these tips in action. 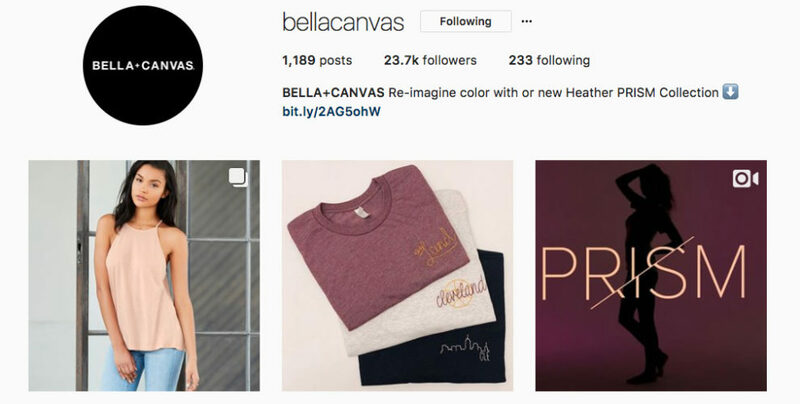 And don’t forget to follow BELLA+CANVAS on Instagram HERE!